How to Cook the Perfect Rice Every Time! 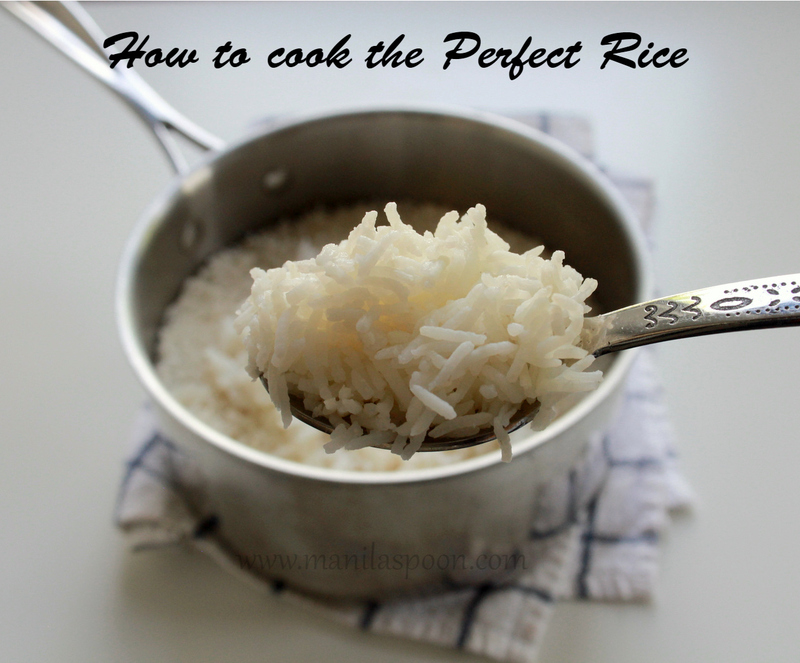 Tried and tested, best and easiest way to cook the perfect rice every time! No more guessing game! There is a joke in the Philippines as I was growing up in the province that a girl is not allowed to marry until she can prove that she knows how to cook rice!! I think I must have been reminded about this many times that it stuck in my head! Thankfully, this is no longer the litmus test before one can marry or many would have flunked right away. But perhaps you are wondering, what’s the big deal with cooking rice? Well, it is indeed a big deal when you live in a country that eats rice at least 3 times a day! Breakfast begins with rice and certainly any viand for lunch or dinner is never complete without a hot bowl of rice. In fact some even have cold rice for snack (“merienda” or “bahaw”) and we do have many rice desserts, too. It is indeed the main staple in the Philippines. So you can understand why it is absolutely necessary to learn how to cook rice. We simply cannot live without it. While I now posses a slow cooker where I regularly make my rice, there are still times when I need to cook rice in a saucepan on the stove top and for those times this is my tried and tested formula. Now let me say first that this formula works best with Jasmine and Basmati rice – the only types of rice I use for cooking in my household. This won’t work for sticky rice or wild rice or even brown rice (all of them requiring a bit more water). If you wish to cook with the regular American rice, I suggest using just the ratio of 1:1 – 1 cup of water per 1 cup of rice because in my experience regular American rice has the tendency to be mushy and doesn’t require that much water. This rice will result in the cooked rice that you will usually find in a typical Chinese restaurant. It would be dry and not moist or watery. Just like how we Asians love it! So it is certainly perfect for your favorite Asian dish. To rinse or not to rinse? It all depends on you. Rinse, if you don’t like rice grains with all the starch in it or when you prefer the grains a bit more separate rather than clumpy. I don’t always rinse especially if pressed for time but I rinse when I can. Also, some people say that when you rinse you wash away the nutrients in the rice – I am not particularly certain about this and I haven’t researched this thoroughly though. I just know that we rinse twice in the Philippines because some rice husks and chaff still remain with the grains and we rinse to wash these out. On the other hand, the packed rice you see in the stores here in the US have been cleaned (no more husks or chaff) thereby eliminating the need for any extra rinsing unless you want to remove the starch. So it’s up to you. 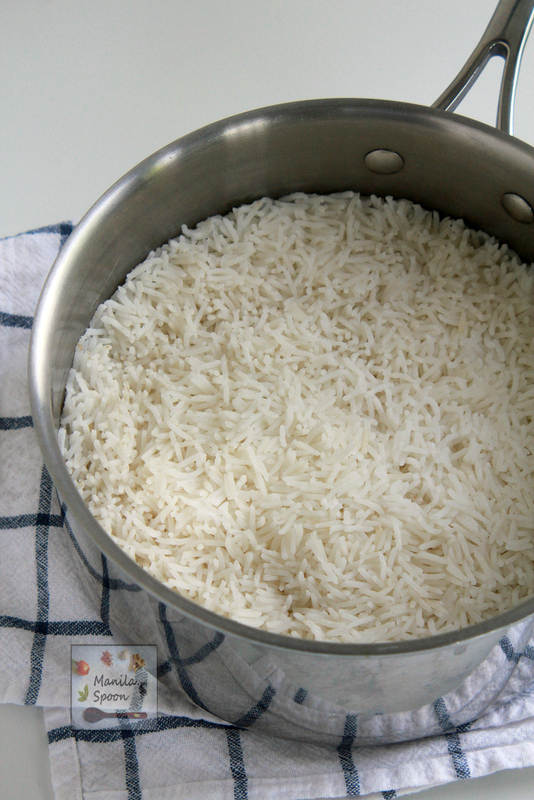 The key is, should you decide to rinse, to ensure that the rice be thoroughly drained after rinsing. The basic formula is 1:1 1/2 cups — 1 1/2 cups of water for every cup of rice and for a maximum of 3 cups of uncooked rice for best results. You can use this measurement both for stovetop and rice cooker. It works either way. And if you use Jasmine and Basmati – you’ll have the perfect rice every time. Now, this recipe simply covers the basic rice — plain rice and water — no flavoring added. This is how we cook rice. We cook without any flavoring because as you know, Asian main dishes are already quite loaded and strong in flavors so there’s no need to dress up the side too much. We certainly prefer it plain. But certainly you can jazz up your rice but using chicken broth instead or even some butter and citruses, too! Anyway, hope this formula helps! 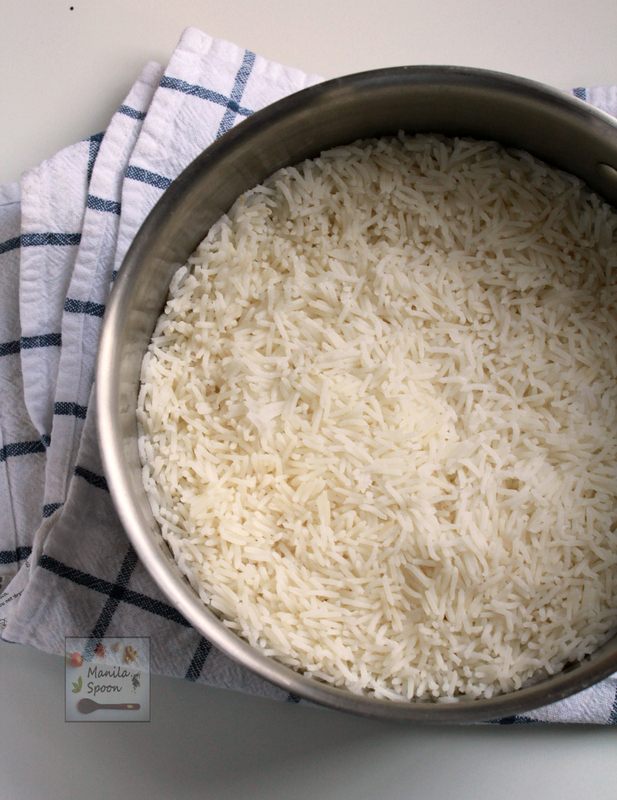 Rinse the rice twice (or leave unrinsed if you’re not bothered with the starch). Use your hand as a rake as you rinse it. Use a fine strainer and dry thoroughly. Return the rice into the saucepan. Turn off the heat. Do not remove the cover but let it stand for 10 minutes. Uncover and fluff with a fork. Serve in a platter immediately. If there are left-overs, chill in the fridge and use it for fried rice the next day! Thanks, Julia! It sometimes depends on the kind of rice you use as some rice want more water than others. Jasmine and Basmati don't require much water in cooking and also because we prefer a dry rice and not a moist one because most Asian dishes have sauces to moisten the rice. Thank you for your sharing your expertise in this skill. For truly perfect rice, you have to have the right rice and the right technique! That is so true! Thanks Amanda! I have a hard time getting my rice just right. I'll have to follow this and see if it gets it right. Hope it works for you Pam! Thanks! We love rice. It's so affordable and versatile. Plus many are gluten-free. I always cook mine in either an Instant Pot or my Ninja but I do recall the first time I cooked it on the stove my ratio was slightly off. I cook mine all the time in the rice cooker but for those times when only the stovetop will do, this works well.Thanks! Yup, it can be tricky for some so I hope this helps somehow. Thanks! I cook rice almost everyday, i use my pressure cooker most of the times and some times cook it in open pan. I know many who struggle with the right quantity of water to get it fluffy 🙂 A very useful post! Thanks! I love rice a lot too! How can you cook rice in open pan ? Will not the heat goes off without sufficiently boiling the water to soften the hard grains ? We in India always use either covered pots or rice cookers commonly everywhere. 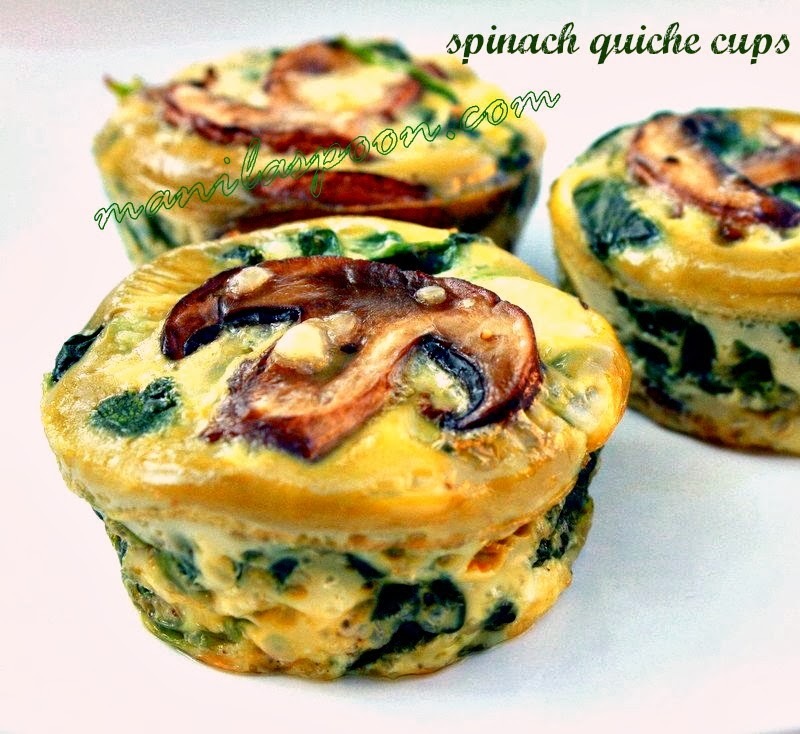 Have you read the recipe? I am asking because I think you missed the part which stated that the pan should be covered after it has started to boil. I don’t cook it with an open pan. That would dry up. Anyway, thank you for stopping by and asking this. Now I want to take a better look at my rice next time I cook it! 😉 I have never rinsed rice, but I might give that a shot to see what the difference is! Sometimes, I rinse and sometimes I don't especially if kids are looking so hungrily at me!! So its up to you. I love steamed white rice and love when it comes out perfectly. Getting the right quantity is key for sure. Great article. Thanks Christine for the kind pin! Glad that it may come useful to you someday! My husband only eats rice.. lol.. and even with a rice cooker her still struggles to get the "perfect rice". I would have def share your tips with him. Thanks and hope you both like it! Great tip! I always want my rice to turn out perfectly every time and sometimes it's not quite there. Not bad, but not perfect either. I have a rice cooker(steamer) that doesn't do a bad job. I do rinse rice, depending on what kind I buy. I'm following your advice. Thanks Marisa and hope it works well for you. Thanks for this thorough tutorial and for all the tips! I usually use a 1:2 ratio but will have to give this a try! Jasmine and basmati are my choice when I make rice! I noticed the water:rice ratio is different from what I normally do. I'm guessing your recipe will come out a bit moister than what I've done in the past. How delicious it looks! I will try your recipe. Hope the cooked rice will be as delicious as the images. Carol: Will ratio and time work well with Brown Rice? No. Brown rice requires more water and cooks longer than white rice. This only applies to white rice. I bake my converted rice 1:2 and it’s always perfect but doesn’t work well with Jasmine. I’ll try this tip for that. Thanks.